My birthday was last Wednesday. I always enjoy the facebook messages so much. I hear from people I usually do not hear from on my birthday. I had several phone calls, texts and messages on facebook to make it a lovely day. Then at noon, I hear a honk in my driveway. It was my mom and dad. They brought me a pie...I am not a huge fan of cake. 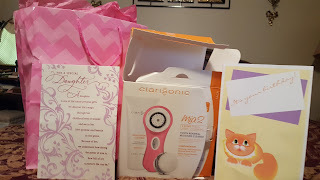 They also got me a Clarisonic Mia 2 for my birthday that I have been enjoying. It is supposed to clean deep down in your pores. I love it. It makes my face feel really soft. I had to take Josh to Sylvan that night, so when I got home Karl was home and bought me flowers and a really cool card that you had to "blow out the candles" and when you do, it plays the "happy birthday to you" song. It was cool. I am never home on September 11th usually, but I was this year and I read the postings on facebook. It is funny, I cannot remember what I did some of the days last week, but I remember everything that happened that entire day of 9/11/2001. I got one of our flower beds cleaned out and had Karl clean the other one...(it had poison ivy in it and I am severely allergic). 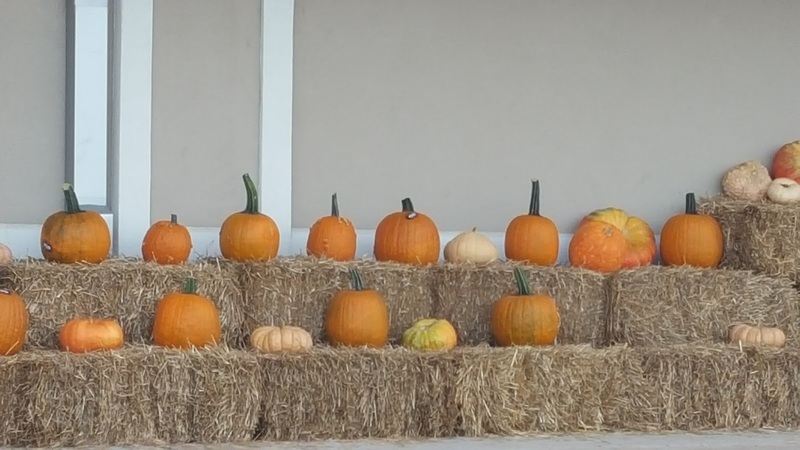 Anyway, I have started decorating my yard for Fall. 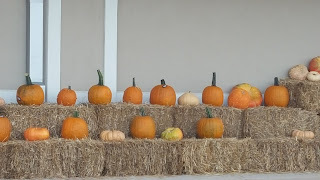 I still need to pick up my Mums and pumpkins and I am going to get a bale of straw this year and put out a scarecrow. I have not done that in several years because the straw is a pain after the season is over. I have a certain store I look for my Mums at. Last week they did not have them yet, so I am going to look tonight. The picture is at the store where I get them last week that is what they had. My mom wants some too, so once I find them, we will plan an outing to get them. I hope that happens this week. The city just drove by cutting tree limbs for the winter. They cut them out of the power lines so when we get ice and snow the power does not go out because of trees. So, that looks nice too. Have a great week!!! Hi Lori, Happy Birthday just a little late! Such cute cards. Glad your hubby got you the flowers. 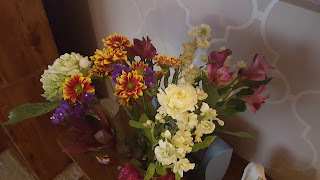 I love surprises and that would be a wonderful one. That's for sure. I'm watching a program about Jim Henson and the Muppets on PBS. Such talented, creative folks. Amazing! Part 11 of Disney is on after this show. So much we don't know about the man. Interesting! Hope you're having a wonderful week. Hugz!